Initial response time varies from between 1 week to 1 month, depending on the individual. Maximum breast enlargement can be expected after 3 full months of use, with increases of 1 to 3 inches in breast size. If use is discontinued the breasts will return to the original shape over time. Additional benefits include potent anti-breast cancer effects. 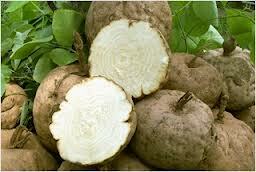 Pueraria mirifica helps prevent menopausal symptoms and osteoporosis. Fiancee can be used as an antiageing supplement, as it provides a positive effect on the health of hair, skin and a youthful appearance. To benefit from these properties you do not need to take the higher dosage. The time it takes to see the improvement is individual. 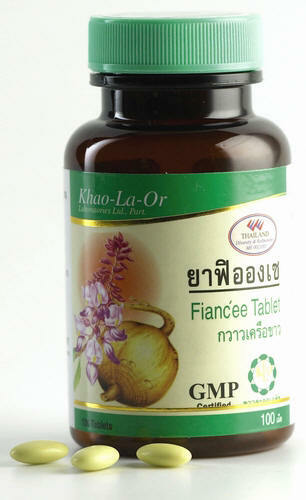 Pueraria Fiancee can be taken as maintenance after stopping the intake of the higher potency of Pueraria mirifica. 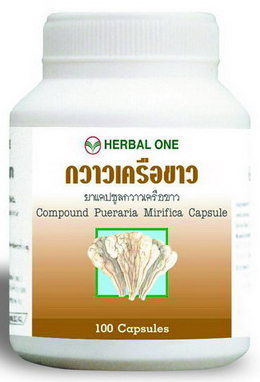 Indication: Healthy women can take the higher dosage of Pueraria mirifica continuously during 3 months. After this period either a break or a change to the lower dosage should be made. Most women are very concerned about aging, particularly concerning the effects brought about by the aging process. For the average women, menstruation cycles end at 48-50 years of age when the reproductive system stops or slows down functioning. The body experiences dramatic changes due to lower estrogen levels: the body's systems and its functions begin to decelerate and the immune system weakens accordingly. Menopausal women will usually experience both psychological and physiological changes. Psychological changes range from anxiety, tension and nervousness to chronic depression, whereas the physiological changes include hot flushes, fatigue and insomnia to more severe conditions as bone loss, balding and degeneration of the reproductive area. 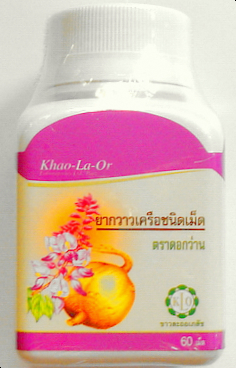 Consequently, women at the age of 45-50 and post-menopausal women need something to replace the loss of natural estrogen. Hormone replacement therapy (HRT) has been extensively used to alleviate both the psychological and physiological changes. However, this estrogen substitute can be quite expensive and must be conducted under a physician's close supervision. An effective alternative approach would be to delay those aging problems by using natural phytoestrogens present in Pueraria mirifica as a dietary supplement. 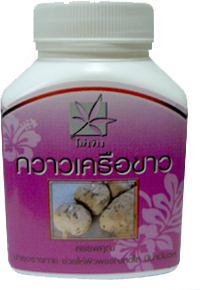 Local communities in Thailand have used Pueraria mirifica (White Kwao krua) for well over a hundred years, specifically for its rejuvenating qualities. 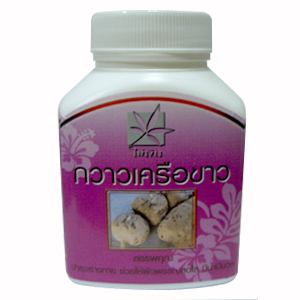 The belief in the rejuvenating properties of Pueraria mirifica has been passed down from one generation to another and more recently through the publication by Luang Anusan Suntara. Serves as the "Fountain of Youth" for aged men and women.